Ground Name: Broadfield StadiumCapacity: 4,996 (1,150 Seated)Address: Brighton Rd, Crawley, West Sussex, RH11 9RXMain Telephone No: 01293 410 000Fax No: 01293 410 002Pitch Size: 110 x 72 yardsTeam Nickname: The Red DevilsYear Ground Opened: 1997Home Kit Colours: Red & WhiteOfficial Web Site: www.crawleytownfc.netAbout the Broadfield Stadium – Capacity: 4,996The Broadfield is typical of a number of new stadiums built at a non-league level. It is functional, neat and not really ambitious but does allow the club to expand as the team progresses through the leagues. It opened on a new greenfield site to the south of the town centre in 1997. It has one large single tier covered stand that has seating for around 1,000 fans that unusually runs from penalty box to penalty box. Supporters enter either side of the main stand for all parts. Opposite this stand is a shallow 3 step uncovered terrace, which could be made bigger (and roofed) if the club gain promotion to the Football League structure, although based on the current facilities the stadium would meet the entry criteria. Behind each goal (and around the corners to meet the Main Stand) are covered terraces with 6 steps. The home fans congregate behind the south goal. The stadium has a large bar, called Reds, which is part of the south stand and allows fans the opportunity to meet and have a beer before and after the game.How To Get To The Broadfield StadiumIf you are driving to the stadium then it is one of the easiest to find in English football. Exit the M23 at junction eleven and take the exit on the roundabout signposted Crawley A23. The stadium is a mile down this road on your left. You can either park on the grass verge as you approach the stadium, or in the leisure centre car park on the opposite carriageway. Alternatively for £2 you can have one of the 600 spaces at the ground, although it may take a time to leave at the final whistle. If you are coming by train, get off at Gatwick and follow signs for local buses where you can get a Fastway 10 or 20 bus direct to the stadium for £1.50. The former also calls at Crawley station (journey time 5 minutes) whilst the latter calls at Three Bridges station (journey time 10 minutes).How To Get A Ticket For The Broadfield StadiumUnless the club draw a big team in the FA Cup you will always be able to pay on the turnstiles to get it. A terrace place costs £13 for Adults and £4 for Children, and a place in the Main Stand is £16 and £6. You can also pay £30 for a seat in the Executive area which includes a hot meal beforehand and all the trappings of non-league luxury. You can book tickets for this area by calling the club on 01293 410000. 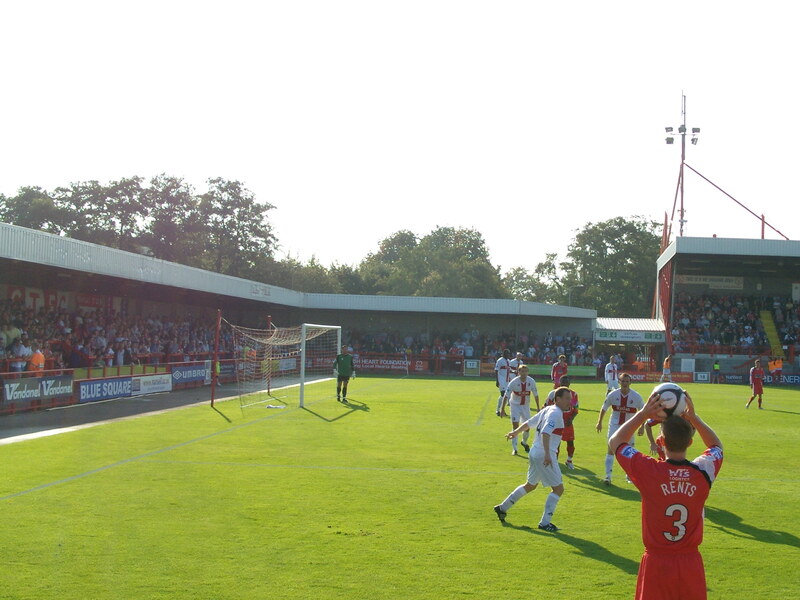 About Our Last Visit – Crawley Town 1 Kettering Town 0 – 27th September 2008 With Fulham deciding to charge us poor (well we will be once we have paid £30m or so to Sheffield United, and God knows how much to those distressed Blades fans who are now suing us!) West Ham fans £48 for a seat in the temporary stand at Craven Cottage, and the Little Fullers off for a day of parties, I scanned the fixtures for a suitable game. The usual criteria applied:-1. A ground that I had not been to for more than 5 years; 2. Less than an hour’s drive away 3. Ticket price less than £20 So that immediately ruled out every league club in London and the South East of England. The one possible exception was QPR who were at home to Derby County, but the only available tickets were a whopping £40 so that was knocked on the head. So I cast the net a bit wider and went into the Blue Square Premier League and game across a little gem that hit all 3 criteria – Crawley Town versus Kettering Town. As luck would have it this was also the biggest game of the season so far in the Blue Square, as it was first versus second. Crawley Town had had a nightmare last few seasons, going into Administration on two separate occasions plus being fined and had points docked at the start of last season due to bringing the game into disrepute. With a lack of players available for the start of last season the future looked very bleak for the club. However, they managed to survive the season, finishing in 15th place. This season a huge breath of fresh air has blown through the club and they had started in fantastic fashion. Seven wins out of their first eleven games, and top scorers too boot saw a huge reversal of fortune for the club and they came into the game in top spot. The visitors Kettering Town had also had a turbulent recent past, including a stint in charge by Paul Gascoigne. Last season they were promoted from the Blue Square Northern division. But five wins and five draws from their first eleven games saw them come into the game on a real high. 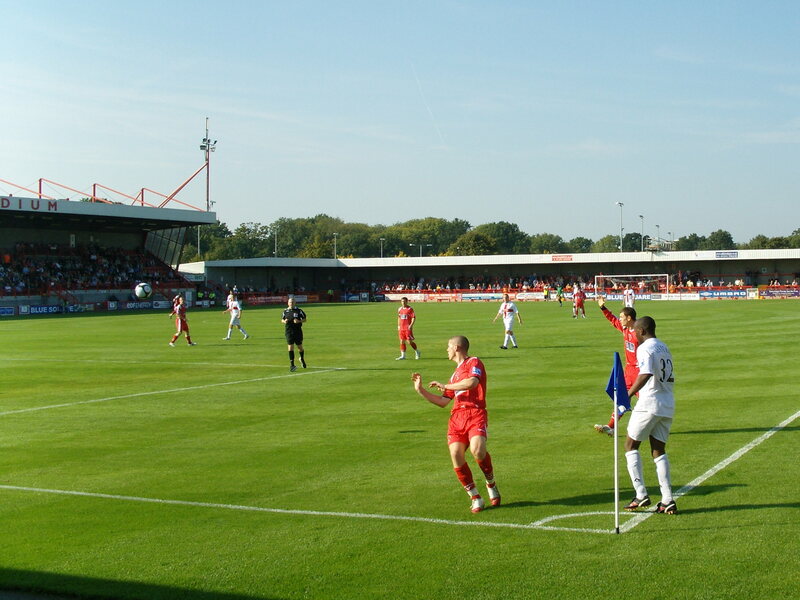 Crawley’s problems in the late 1990’s can be seen to stem back to the move to the new stadium, Broadfield, located on the edge of the town and close to the M23. It is a typical new build stadium with a capacity of around 4,000. It was certainly easy to find, just a mile from junction 11 of the motorway and only just over 30 minutes from home. The Broadfield Stadium could hardly be described as having much character. 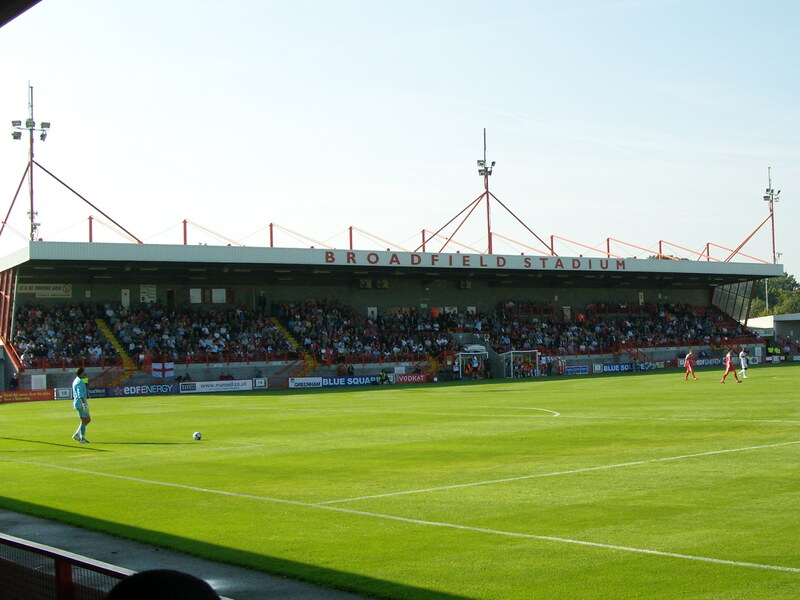 In fact Crawley could hardly be called a town with any character, although it appears to be very neat and tidy, which quite nicely sums up the stadium too. For £2 I got a parking space just outside the south stand, although you have to drive through the beer “garden” of the club bar much to the disgust of the drinkers – “Oi mate, your Zafira spilt my pint!”. The Crawley chairman had urged fans to get to the stadium early to avoid congestion, and pulling up at an empty car park at 2.45pm I thought it may have been a little bit of a hollow statement. At least the admission price was sensible. £13 for a terrace place was good value, and despite being just one level below the Football League they had not tried to price the fans out, as some nameless teams had (Ok, Aldershot Town). The stadium is 4/5ths terracing which one large covered stand that runs from penalty box to penalty box. Behind each goal the terracing is covered, allowing both sets of fans to create a noise. Along the other side of the pitch is a 3 step open terrace, which if required can be made bigger and roofed should league football come at the end of the season without much fuss or disruption. One thing I did love was the sign for “Home Cooked Food”. I queued up and for £6.50 got a Bacon Cheeseburger, chips and a cup of tea. All cooked in front of my eyes. So unless the two ladies actually lived in this small kitchen I would seriously doubt that this statement was actually true! The form of the two teams coming into the game was certainly impressive. Kettering’s only defeat had come 6 days earlier away at Nigel Clough’s Burton Albion, and Crawley were on the back of a 8 game unbeaten run. You would have expected the Blue Square Conference to be dominated, even at an early stage by the relegated teams, who this year were Mansfield Town and Wrexham but it never works like this. It is actually rare for a relegated team to bounce straight back up into the leagues. Hereford United, now in League One had taken over eight seasons to make the journey back, and last season both Aldershot Town and Exeter City returned to the league after big gaps away. This season, apart from the two teams on show here, the top of the table included other unfashionable names such as Histon and Salisbury City proving the competitiveness of this league and further strengthening calls to actually make it part of the Football League structure. I had high expectations of the game, and the crowd. However, I was disappointed on both counts. Looking at the programme for previous attendances I was very surprised to see their five games so far produce a total of just over 6,500 at an average of 1,300. I am sure that league football would bring the locals out in force but clubs like Crawley need the support on a weekly basis now. It was also interesting to see on such a sunny day the huge variety in replica shirts on display. I counted 8 different Premier League ones, a couple of Championship ones, one from Division One (Leeds United) as well as five or six international ones. Plus one from Glentoran in Northern Ireland! Many of the locals were sporting Crawley ones though so at least there was some passion there. The game itself was poor. I was expecting so much more and I left very disappointed. The ball spent so much time in the air which explained why the pitch was in such condition. I appreciate it was a warm afternoon but even so with so little skill on display by both teams it makes you wonder how they would survive at a higher level. The only goal of the game came on the 11th minute mark when Crawley’s centre forward Jon-Paul Pittman finished well from close range after a free kick had not been cleared. Kettering’s main weapon was the huge throw-ins from their centre back with a fantastic name, Exodus Geohaghan. Towards the end of the first half one of the rockets actually ended up with the ball, goalkeeper and defender in the net but unsurprisingly the referee called the friendly shoulder charge illegal. Exodus’s last contribution in the game was a second clumsy challenge on the Crawley forward in the 60th minute and he made like his name seeing a red card. These combined incidents, coupled with a penalty not being awarded incensed the away fans, and two of them decided to invade the pitch to try and get to the referee. Unfortunately they made such a hash of negotiating firstly a crush barrier (trying to climb it instead of going under it) and then the advertising hoardings (requiring a “hand” from another support to get his leg over) that the officials had time to call the police, drive to the stadium, park, enter the ground and casually walk over to the stand to intercept them before they got onto the pitch. So with two minutes to go I made my retreat, walking a total of 17 steps from terrace to car door. Now who said that this was Mickey Mouse football!